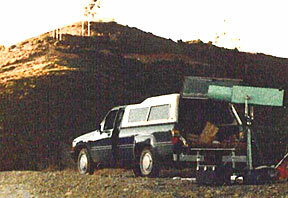 Don’s massive custom binocular rig at the Loma Prieta site. This wasn’t the best of nights for astronomy. The sky was hazy, even at the 3360 foot level of Loma Prieta. This haze reflected light from the city of San Jose in the north and Morgan Hill and Gilroy in the east. Otherwise, the sky was clear and there was no wind, so the decision was easily made that I would, on this Monday morning, May 12, hunt for new comets in the eastern sky as planned. After all, this wasn’t the worst of nights for astronomy neither. I proceeded to set up my binoculars. 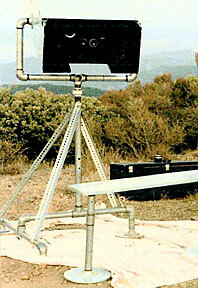 They are homemade, the lenses (actually aerial telephoto lenses) are five inches across and magnify 29 times. The instrument weighs over 100 pounds. In April 1983 I had seen these lenses being sold at our astronomy club auction. At first sight I wasn’t overly impressed with the lenses; in fact, I left the auction before it ended and never saw them bid upon. In the following week, I began to consider making a pair of large binoculars with them. Calling Jim Van Nuland, who had conducted the auction, I learned that Steve Greenberg owned the lenses and that they had not been sold. I called Steve and he said I could have them for $50.00 each, a bargain price. I spent the next two weeks planning and designing a binocular system using secondary mirrors. When I was convinced that it would work and be completed for under $300, I bought the lenses and ordered the mirrors. Following two weeks of construction, I now had a pair of large binoculars. Everything is enclosed in a plywood box measuring 36″ long, 22″ wide and 12″ high. Each of the two light paths has two elliptical mirrors, one measuring 2.60″ in minor axis, and the ether measuring 1.87″. The light strikes the first mirror, right angles toward the center of the optical system then strikes the second mirror and exits out the eyepiece through the back. The eyepieces are surplus 30 mm Plossels that I already had and give a 2.4-degree field. They set into plastic PVC pipes making focusing difficult. Originally I was able to vary the distance between the eyepieces, but then I changed them to a fixed position so that the alignment remained more stable. The contrast is good on this instrument. I can see “star clouds in every constellation”. However, I use them for about one-third of my comet hunting. For most of my searching, I use my 10-inch, F/3.8 reflector telescope at 32 power. The field of view has been stopped down to 1.6-degree square. With it, I have discovered two comets. 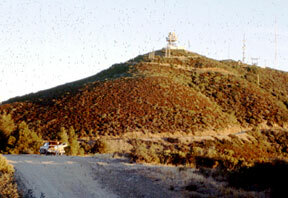 Loma Prieta, the site of many of Don’s comet discoveries. The binoculars and the telescope are roughly equal in picking up faint diffuse objects. Although the telescope is larger and gathers more light, using two eyes in the binoculars helps to acquire faint objects too. I can cover the skies faster with the binoculars, but it is difficult to boost magnification to check out suspicious objects. Each instrument has its advantages and disadvantages. On May 12, 1986, I began comet hunting session #1471 at 1:50 AM by scanning or sweeping, the sky-high in the east. While looking through the binoculars, I would slowly rotate the binoculars from right to left, looking among the pinpoint stars for small fuzzy clouds. Most of the time these “small clouds” turn out to be clusters of stars, galaxies or nebulae. If not, it could be a comet. At the end of each sweep, I swing the binoculars back to the original point, lower them one to two degrees, and then repeat the process. By starting high in the eastern sky and slowly working my way downward, I should reach the horizon in about two and a half hours. Time goes by very quickly, as I’m quite busy “working” the morning eastern sky. The Milky Way looked fine during the early part of my sweeping, with several star clusters and nebula catching my attention. My eventual downward motion freed me of the Milky Way and into the rather “bare” sky with few stars. Here I picked up a little more speed and by 3:45 AM I swept up the Great Andromeda Galaxy, M 31. Don’s binocular setup awaits another night of discovery at Loma Prieta. Worldwide, perhaps no more than a dozen comet hunters are sweeping the sky this morning. Because of the time and discipline needed, few amateur astronomers take up this hobby. I began on Jan. 1, 1975 with the idea of trying to find a comet. Besides, having done ten years of observing the moon, planets, asteroids, galaxies and clusters, and then photographing them, I wanted a program that would challenge me and encourage me to look through the telescope. Monitoring variable stars, chasing asteroids or hunting comets would all fulfill these requirements. Noticing that few Americans hunted comets, but that lots of second-hand advice were written on the subject, I decided to hunt comets and see for myself what it was all about. Besides, I had read that it took only about 300 hours of searching to find a comet. I felt I could benefit from 300 hours of looking through a telescope even if I didn’t find a comet. After 1700 hours of searching, I discovered my first comet. Comet Machholz, 1978L, was found on the morning of September 12, 1975, from Loma Prieta. Seven years and 1742 hours later I found my second comet (Comet Machholz, 1985e). This find was from the Riverside Telescope Makers Conference, near Big Bear, California. On the morning of May 12, 1986, it did not occur to me that it was exactly 50 weeks since I had found Comet 1985e, but it was. Instead, my mind was rolling around some ideas for “Comet Comments”, my comet column which had been published in various astronomy club newsletters each month for eight years. 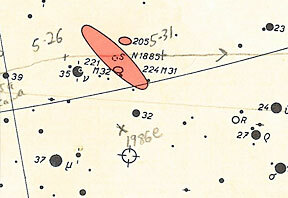 Don’s star atlas showing Comet Machholz 1986e’s discovery position. Halfway through my next sweep, something near the top of the field caught my attention. I stopped sweeping and examined it. It looked like a small fuzzy object, but perhaps it was a small group of stars. I placed it in the center of the field of view. It looked like a diffuse object, round, just within the limits of visibility. It was 3:52 AM. The radio was playing the song “Against All Odds” by Phil Collins. Checking its position, I determined that it was two degrees south of the Andromeda Galaxy. There were no galaxies or clusters listed on the maps, now I had to check to see if it was moving. A comet should slowly move against the stars. I drew a map of the region, placing an “X” at the comet’s location. I then resumed cornet hunting. At 4:17 1 returned to the object’s location and compared it with my map. It appeared to be moving, but I couldn’t really be sure. I again resumed sweeping. At 4:39 the sky was beginning to brighten as dawn was approaching. I refound the object and was very pleased to detect motion. It was a comet! I awoke my wife, sleeping in the truck, and showed her the comet. I then put the binoculars into the truck and we drove the 22 miles home. From here I phoned the Smithsonian Astrophysical Observatory in Cambridge, Mass., and reported the comet to Daniel Green. He had not heard of any other objects in the area and together we felt this was a “reasonable suspect for a comet. I then went to work. The workday went by quickly. I assembled fiber optic connectors for medical lasers and this was a good workday. Upon arriving home I phoned a few amateur astronomers and Lowell and Lick Observatories, asking them to confirm the object to be a comet. 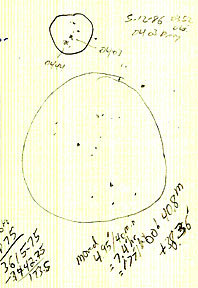 At the telescope, Don drew this sketch which confirmed that the object was, indeed, moving. The next morning found my friend Rich Page, Laura and me on Loma Prieta. Shortly after 3:00 AM I turned my binoculars to the area and searched for the comet. After a few minutes, I found it, 1.5 degrees northwest of its previous day’s position. Again it appeared round, but in Rich’s 14” telescope we could detect a short tail on it. When I arrived home and phoned the Smithsonian Observatory, word was just coming in from Charles Morris that he and Alan Hale of Southern California had confirmed the existence and location of the comet. It was them named “Comet Machholz”, also known as comet 1986e. When a comet is first discovered, the type of orbit assigned to it is a parabolic curve, meaning that it will return only in a very long time. My first comet turned out to have a hyperbola orbit, meaning that it would never return. My second comet appeared to have a parabola orbit, but it disintegrated when it got too close to the sun and was never seen again. This third comet turned out to have an elliptical orbit, and thus the comet 1986e will return in 5.4 years. This proved to be quite exciting at the Smithsonian, as periodic comets with this short an orbital period are rare. And of all the short-period comets known, this one comes closest to the sun 12 million miles. At its farthest point, it goes just beyond Jupiter’s orbit. The path of this comet is tilted 60 degrees to the earth’s path around the sun; it enters the inner solar system from the south and exits in the north. For several weeks following discovery the comet dimmed as it was rapidly moving away from the sun. At times it seemed to change appearance in a matter of a few minutes. I was able to observe it for a month, and then it got too faint for me to see. During 65% of its returns, the comet is not well placed for discovery. But this time it was well-placed, and I feel fortunate to have found it.